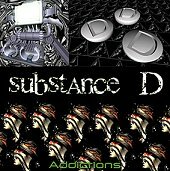 SUBSTANCE D is a new breed metal band that takes the lessons of the last few years in the genre and reinvents them for the next century. Hard as nails, heavy as hell and industrially driven "Addictions" is the kind of album that shows the future of metal isn't entirely dependent on exploring the past. This CD is relentless and fierce and SUBSTANCE D proves to be a band that has the talent and vision to take their music anywhere they want to. They don't allow themselves to become redundant or repetitious but they also make sure that they aren't wandering so far from their root sound that they seem disjointed. Lyrically the album explores a variety of addiction themes, as if you are stepping into the shoes of an addict for a few days and watching them deal with their demons. At times the imagery is so harsh that it is closer to crawling inside the skull of an addict, than the shoes, which makes it all the more effective.